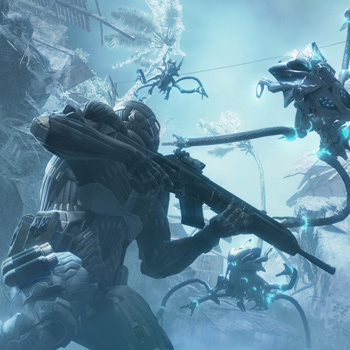 Crysis is a next-generation PC first-person shooter from Crytek, the award-winning developers of "Far Cry." It is 2020, and global tensions have reached boiling point as the and square off in the South China Sea. At stake: a mysterious artifact uncovered by a team of archeologists. The North Korean government quickly seizes the area, prompting the to dispatch an elite team of Delta Force operatives on a rescue mission. During the siege the true nature of the artifact quickly emerges, pointing to the existence of an alien presence on Earth, and ultimately the trigger for a massive-scale alien invasion. The battle to save Earth begins as the aliens' flash freeze the tropics into a ghostly-white frozen landscape. As gamers take up arms against the aliens, they will be outfitted with customizable weapons and a high tech Nanosuit, allowing them to adapt their tactics and abilities to a hostile, ever-changing environment and a mysterious enemy.